We move everyone in at basic rent with the possiblity of getting rental assistance through USDA Rural Development after move in. Our waiting list is set offer units to Low income individuals first then Low income then Moderate income. One, two and three bedroom affordable apartments for individuals and families. Subsidy is avalible for 26 of our 36 apartments through USDA Rental Assistance Program when assistance is available,rent is 30% of adjusted income. Rivergrove is located in old town Battle Ground and within walking distance to many businesses. Large trees create a garden setting with a small pleasant stream passing by outside of our fenced grounds. We have two on-site laundry rooms and friendly, attentive managers. 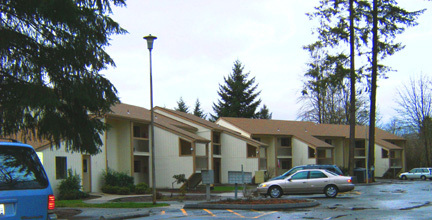 Rivergrove Apartments are only 1 block from the bus line. Income Limit Details: Below USDA moderate income limits with preference for lower limit households. WSHFC Tax Credit limits also apply. We have two on-site laundry rooms, one block away from bus line. Rent Detail: Subsidy is avalible for 26 of our 36 apartments through USDA Rental Assistance Program when assistance is available,rent is 30% of adjusted income. When not available, a non-subsidized basic rent applies. Rental Assistance is awarded based on greatest need. We accept housing authority provided Section 8 vouchers in our non subsidized apartments.